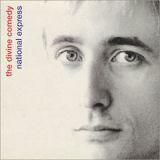 Mike Skinner did it, Abel Tesfaye does it and so does Neil Hannon to name just three. Do what you’re thinking? One person performing under a group name, Skinner as The Streets, Tesfaye as The Weeknd and Hannon as The Divine Comedy. He began making music, under the name The Divine Comedy in 1990 and released the albums Fanfare for the Comic Muse (1990), Liberation (1993) and Promenade (1994) which all went relatively unnoticed. In 1996 his fourth album, Casanova got noticed after Chris Evans discovered it and played the opening track, Something For The Weekend, on his Radio One breakfast show. It was released as a single and reached number 14. The parent album peaked at number 48. Over the next couple of years he released half a dozen singles most of which made the top 30, but his biggest hit arrived in February 1999 when National Express, the third single from the album Fin de Siècle, reached number eight. Ironically, the accompanying video shows Neil as a psychiatric hospital patient awaiting treatment and being pushed around in a wheelchair by a porter that had trouble controlling his behaviour. It sort of takes the Mickey out of the National Health Service, but Hannon has always denied this. Neil has written two Channel 4 television theme tunes, firstly, and more famously, Father Ted in 1995 and then The IT Crowd, a comedy set in the London offices of the fictional Reynholm Industries which first aired in 2006. Later that same year he contributed two songs, Love Don’t Roam and Song for Ten to the Doctor Who soundtrack. In 2010 he recorded songs to a musical version of Swallows and Amazons which premiered at the Old Vic in Bristol. Hannon continues to make music and last month saw the release of his latest album Foreverland which contains 12 new tracks and became his highest charting album to date when it peaked at number seven. He’s back on tour in 2016 and his sets now include some cover versions of songs in which he puts an inimitable spin by changing some of the lyrics. Two that have been highlighted by his devoted fan base are Prince’s Raspberry Beret and Nelly Furtado’s Maneater.